Whether attending a wedding or saying your own “I do’s”, Hairstyle Inn Salons Saskatoon is here for your bridal beauty needs! With our 38 member talented creative team, you can be confident that our stylists will create the look you want for your special day. 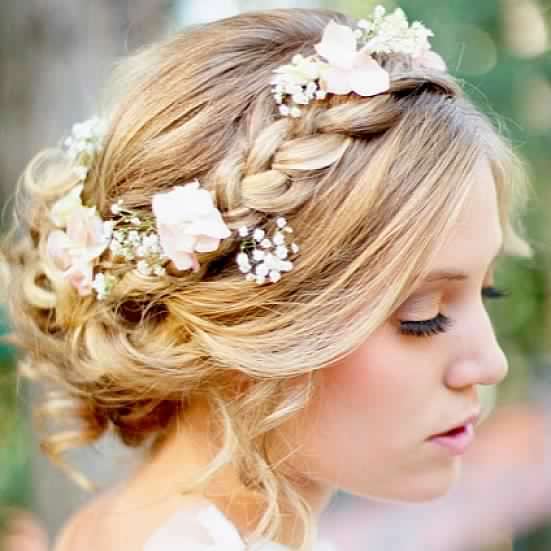 Browse through our Saskatoon & PA wedding hair / event gallery today to find inspiration for your bridal hair! As the saying goes, hindsight is 20/20. So who better to scoop wedding hair and makeup tips from than women who’ve already walked down the aisle? Find out which beauty moves made these past brides the belle of the ball and what they would have changed if they could go back in time. -Vanessa O’Malley, full-time mom, Summit, NJ. –Alyssa Dineen, fashion stylist, New York, NY. -Tammy Gibson, author of A Mom in Red High Heels, Redlands, CA. -Kim Van Dang, branding consultant and founder of KVD NYC, New York, NY. -Marta Walsh, editor, TalkingMakeup.com, Scottsdale, AZ. -Stephanie Smirnov, President, DeVries Public Relations, New York, NY. -Karen Bierman Hirsh, full time mom, Greenwich, CT.
-Alix Campbell, Photography Director, Marie Claire Magazine, New York, NY. -Tia Williams, author and beauty blogger, Shake Your Beauty, Brooklyn, NY. -Daneen Baird, writer & editor of Spoiled Pretty, Philadelphia, PA.
-Jennifer Cattier, corporate lawyer, New York, NY. -Erika Valente, editor of Makeup Bag, Reno, NV. -Mina Pontarelli, DailyMakeover.com Team, New York, NY. Hairstyle Inn Salons should be your first choice for styles and updo’s for graduations and prom in Saskatoon! You can be confident we are up on the latest hair styles, whether it’s a retro look, runway look or a celebrity style. Our 38 member creative team make up one of Saskatchewan’s premier cut, colour and design salon groups, and we have been styling Saskatchewan for over 35 years. Check out our Saskatoon salon gallery for event hair! Predicting a steamy makeout session on the way to prom? Then avoid a red or dark lip at all costs! “Anything that messes up easily or requires precision, time-consuming reapplication is a definite no-no,” says celebrity makeup artist Melissa Silver, who often works with Maybelline New York. Brows are a big part of your beauty look, and no girl wants to appear unkempt at prom. That’s why you should wax your eyebrows at least 24 hours in advance, warns Alley Laundry, “Waxing Guru” for Parissa. “This will ensure your skin has enough time to calm down if you tend to get any redness or sensitivity. This is a big beauty don’t, warns David’s Bridal Style Council member, Carmen Ordonez. “Instead, look for lotions that do have some shimmer. This will give you the perfect amount of glow.” You should also avoid glitter-based eye shadows, as you are likely to end up with glitter all over your cheeks (and your date!) by the end of the night, adds Jamie Kern, founder of IT Cosmetics. *Note: “If your skin is looking oily right before you’re pulled into a picture, you can always use the back of your hands to blot away oil, points out e.l.f. Cosmetics Creative Director Achelle Dunaway. Wondering what kind of wig would suit you? Here is a simple guide to help, or you can just come in and see for yourself today! OVAL: The “Oval” Shaped face is longer with a narrow jaw. This face shape is evenly proportioned and works well with just about any hairstyle, length or texture. ROUND: The “Round” shaped face requires added height to narrow the width of the face and lengthen the neck. The hair should be combed close to the sides of the face and at the nape. OBLONG: The “Oblong” shaped face has a very long and narrow bone structure. A fringe or slight bang, and soft waves or curls in the crown and nape areas help to soften and create the illusion of an oval. HEART: The “Heart” shaped face has a wider forehead and a narrower chin. A fringe over the forehead will soften the width. The hair should sit close to the head at eye level and then fill out slightly from the ears to the jaw. DIAMOND: The “Diamond” shaped face is narrow at the forehead and the chin, with wide cheekbones. Bob styles work well for this shape and a fringe or bang helps to cover the narrow forehead. SQUARE: The “Square” shaped face requires height on top and narrowness at the sides. The wide jaw can be softened with curly textures and wisps of hair around the face. 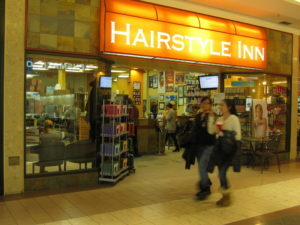 The Hairstyle Inn salon location at the Centre Mall in Saskatoon is conveniently located at the top of 8th Street & Circle in Saskatoon. The salon has been open for 8 years, but the Hairstyle Inn salons have been part of Saskatoon’s salon scene for over 30years- check out our Salon history here! When you come into the salon, you will probably notice the many show and film posters on the walls, signed by cast members. Team members of Hairstyle Inn Salons are sought after as cut, colour and design experts in many venues outside of the salon. These same quality services, & the skills that back then, are & have been engaged by feature TV & film productions, Global TV, Shaw TV, University of Saskatchewan Drama Dept.,Persephone Theatre, Shakespeare On the Saskatchewan, Royal Winnipeg Ballet, Canadian Idol, celebrities( including the inspirational Arlene Dickinson, Mrs Canada & Debbie Travis) & HRDC Canada ,Pivot Point International published in 75 countries in 15 languages & touring Broadway shows to name a few. We welcome walk in’s and are open Centre Mall hours for your ultimate convenience. We have a talented team of master stylists and colourists to serve you – you can meet the Centre Mall Hairstyle Inn team here . The businesses featured on www.trustedsaskatoon.com become Partners…and we promote the mantra that ‘only together are we Trusted” ..we all have our parts to play to ensure the Saskatoon directory maintains the standards and high level of integrity that it does. Trusted then enters into a contract, where the partners sign to uphold the 5 Trusted Guarantees ..these are the foundation of our business and they are the Guarantees that our Trusted businesses offer their clients…to ensure that our partners are upholding these guarantees on a daily basis we have a MYSTERY SHOPPER PROGRAM, where we mystery shop a minimum of 10% of our Trusted Partners on an annual basis… we get our mystery shoppers to fillout a report to tell us about the experience…. 1. How was the greeting/ welcome/ call answered? 2. If retail: Appearance of the store / staff and showroom? 3. Product/industry knowledge of staff? 4. If a quote is required is the quote well laid out/ clear? 5. Did they ask where you found them? 7. Would you return as a customer/ recommend them to close friends? 8. Did anyone stand out as exceptional? If so who? Why? YES “DREDS” EXCEEDED MY EXPECTATIONS. PROFESSIONAL AND GIFT WITH PURCHASE. 9. If you made a purchase/booked a job how was the process? If so refer to the Trusted Guarantees and give an overall mark on each if applicable. 1. Provide the service and quality promised. 2. Complete the job on time. 3. Charge the price quoted with NO surprises. 4. Communicate honestly and be responsive to customer needs. 5. Resolve any issues with customer satisfaction in mind. Please share any other comments relating to your experience with the company. PLEASANT AND HELPFUL ATTITUDE EXHIBITED BY ALL STAFF. PRICE OF SERVICE WAS FAIR AND COMPETITIVE. ! GREAT Job Hairstyle Inn team!! Proving yet again that you deserve the Thumbs up from www.trustedsaskatoon.com !